The Alsace, the home of Choucroute. The Alsace, the historic French region, includes the departments of Bas Rhin and Haut Rhin that border Germany to the North and Switzerland to the east. (Since 1-1-2016 along with the Alsace the old regions of Lorraine and the Champagne Ardennes have been joined together in the new super region of the Grand Est). Dining in the Alsace offers the finest of French cuisine and traditional Alsatian dishes prepared by some of France’s outstanding chefs. Two of the most well-known traditional dishes are Choucroute, a pickled cabbage similar to the German Sauerkraut and Choucroute Garnie a humungous dish of meats and sausages served at family celebrations served on a bed of choucroute. Choucroute, the pickled cabbage of the Alsace, like most pickled foods dates back to the days before refrigeration. Throughout the Old World pickling vegetables for winter was one of the few ways to have a guaranteed supply of green vegetables in winter. It is made with either the familiar white cabbage seen everywhere or preferably with Alsace’s own strain of giant white cabbages the Choux Quintal d'Alsace. 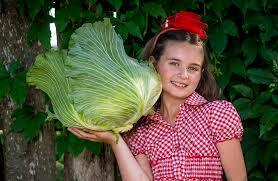 The Quintal d’Alsace cabbage can reach 7 kilos (14 lbs). Photograph courtesy of Baker Creek Heirloom Seeds. Sauerkraut’s creation is associated with Germany, and the Alsace and its neighbor the Lorraine do have a long association with Germany. The Alsace and the Lorraine were passed back and forth like a football between France and the various rulers of German States and then again with a united Germany. Among the results were the addition of many German-influenced dishes to the Alsatian menu, and the use of a German dialect called Allemand Alsacien or Elsässerditsch still used alongside French. Despite these clear connections the local citizens will spend time explaining how their choucroute is far superior to German sauerkraut. They will explain that it is not only the added baies de genièvre, juniper berries, which some German recipes also use; there is much more to choucroute than just pickling cabbage for eight weeks. 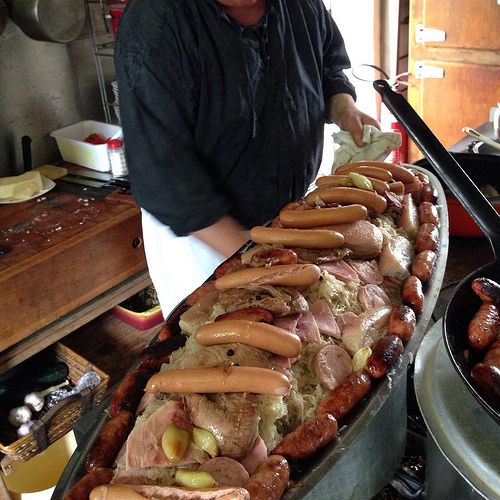 Choucroute is part of the Alsatian psyche. Choucroute as a garniture, the accompanying vegetable. Boudin Noir Sur Choucroute, Pommes Vapeurs et Légumes du Jour – Pork blood sausage, black pudding in the UK, served on a bed of Choucroute accompanied by steamed potatoes and the day’s vegetables. Duo de Sandre et Saumon Sur Choucroute, Pommes Vapeur, Sauce au Riesling – A matched serving of zander (pike-perch) and salmon that will allow the diner to enjoy the different tastes and textures of both fish flavored with an Alsatian Riesling wine served on a bed of choucroute accompanied by steamed potatoes. Jarret de Porc Braisé Sur Lit de Choucroute - A braised cut from across the bone from a pig’s shank; the leg. This cut, when used for veal, is called osso buco in Italian and jarret de veau in French. This is a meaty cut with a bone marrow center that will provide a great deal of flavor while the meat is slowly cooked and then served on a bed of choucroute. Dining in the Alsace includes many dishes without choucroute: timbales, pies; foie gras, fattened goose and duck liver; carp dishes; tarte flambée, the dish the locals call flammen kuechen, and by others is often wrongly called Alsatian Pizza, excellent cakes, unique Alsatian honeys, Munster cheese, and much more. Today, you will rarely find a restaurant that only serves traditional Alsatian dishes, and despite that caveat, traditional accents and dishes will appear on menus along with modern French cuisine creating interesting combinations. There are many excellent chefs in the Alsace, and they are not only found in the most expensive restaurants. Choucroute Choucroute Garnie is the Alsace’s famous humongous dish of sausages and meats that are at the heart of any local celebration. To begin with, a Choucroute Garnie includes two or more pork-based sausages including the region’s own Saucisse de Strasbourg and a local boudin noir, a pig’s blood sausage called a black pudding in the UK. The meats will be pork shoulder, smoked pork shanks, and other pork cuts. Goose, also an Alsatian favorite, may occasionally replace some of the pork or be added to it. The sausages and meats will have been simmered in the oven; each component is added one on top of the other, in accordance with the cooking time required. The main garnish for Choucroute Garnie is rather obviously the Alsace’s famous, juniper berry flavored, pickled cabbage called choucroute. While the meats and sausages were cooking in the oven, the choucroute, the dish’s essential companion, would have been cooking on the top of the stone being flavored with meat stock, gravy from the meats in the oven, goose fat, and herbs. Just before serving the choucroute will have an additional flavoring added when one of the région’s own great white wines is added; usually an Alsatian Riesling AOP. For the seated diners a well-presented platter of Choucroute Garnie can be awesome. A platter that I saw prepared and presented to a table of twelve was absolutely incredible; I think it would have sufficed for a table of twenty-four, it required two servers just to carry and display the platter. Choucroute Garnie is a dish for a crowd so its best to order Choucroute Garnie when you are at least six diners, the more, the merrier. Order an aperitif while waiting, but do not even think of ordering an hors d’oeuvre or an entrée, the French starter, you will never finish a whole Choucroute Garnie anyway. When the dish is ready, at the tinkle of a bell or with a clap of hands the server, and possibly the chef as well, will enter the dining-room bearing the platter of Choucroute Garnie. With the presentation of Choucroute Garnie so important at celebrations, the dish will be carried around the table so all the diners may enjoy the display before it is served. 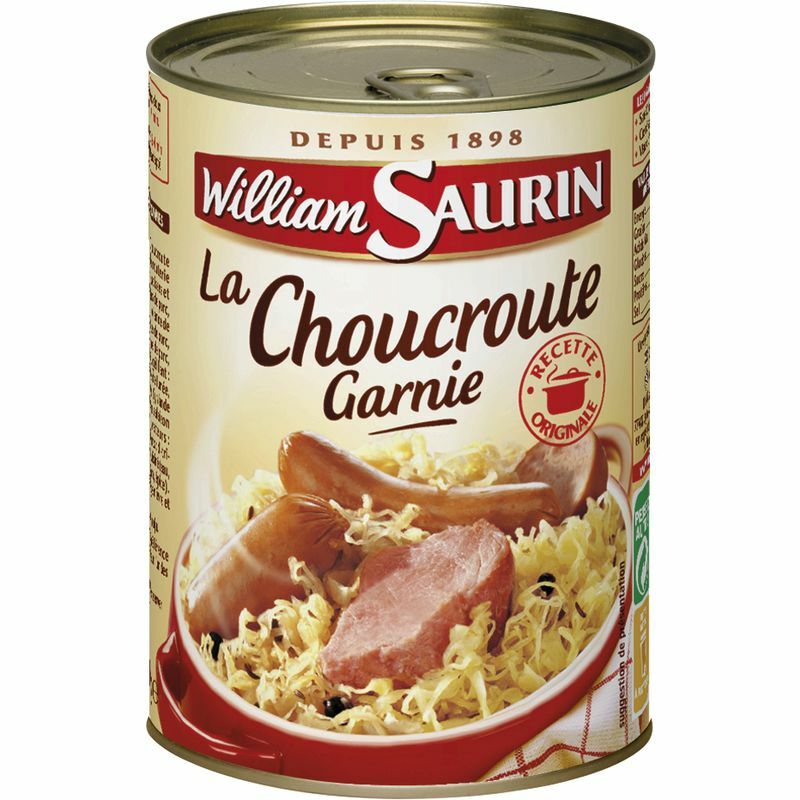 Take Choucroute Garnie home with you. Always order Choucroute Garnie in an Alsatian specialty restaurant; even better, get invited to a Sunday dinner or celebration in a private home. All the components should cook together for several hours, and for that, you need someone who knows what he or she is doing; the presentation should also be a delight for the eyes. I am not a diehard Choucroute Garnie aficionado, but, when I do need my bi-annual Choucroute Garnie fix, I stay with the original, with all the bells and whistles. 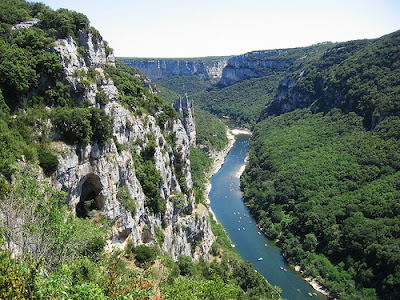 How tourism has changed the Alsatian menus. With the advent of mass tourism, the visitors with their varied tastes encouraged local restaurants to broaden their menus. Many visitors knew about the reputation of Choucroute Garnie but some did not want a dish with such a high-fat content, and some did not want all the pork that is part of the original recipe. 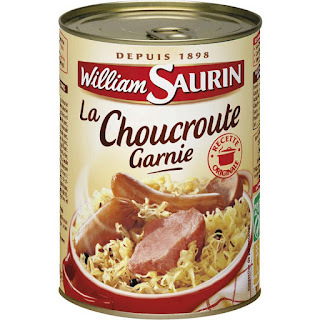 The result will be will found in the restaurants that have upgraded the name and the recipes of Choucroute Garnie. Choucroute Royale - Choucroute Garnie prepared by using the Alsace’s sparkling crémant wine instead of the usual Riesling, it is added just before serving. Despite the use of this excellent crémant, from my experience, it does not make a significant change in the taste that an Alsatian Riesling provides. The Royale version of Choucroute Garnie would seem to me to be a dish originally created for the tourists with fat wallets. Choucroute au Fruits de Mer – Choucroute served as an accompaniment to seafood. This and other similar dishes at least do not include Garnie in their title. Choucroute Garni needs meats that must be cooked for hours to create distinctive flavors; fish cannot be prepared like that. 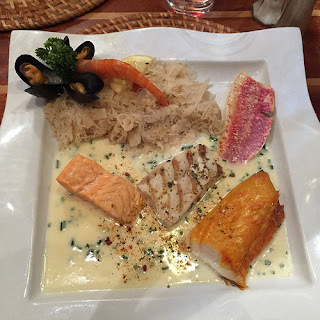 Choucroute au Fruits de Mer is what is; sea fish and seafood accompanied by choucroute. The Alsace is far from the sea, but fresh seafood arrives daily, and Alsatian chefs do wonderful things with shellfish including shrimps, Dublin Bay prawns, mussels and oysters among other options. Choucroute de la Mer – Choucroute served with salt-water fish; the fish of choice may include gilthead seabream, red mullet, John Dory, monkfish or European sea bass. 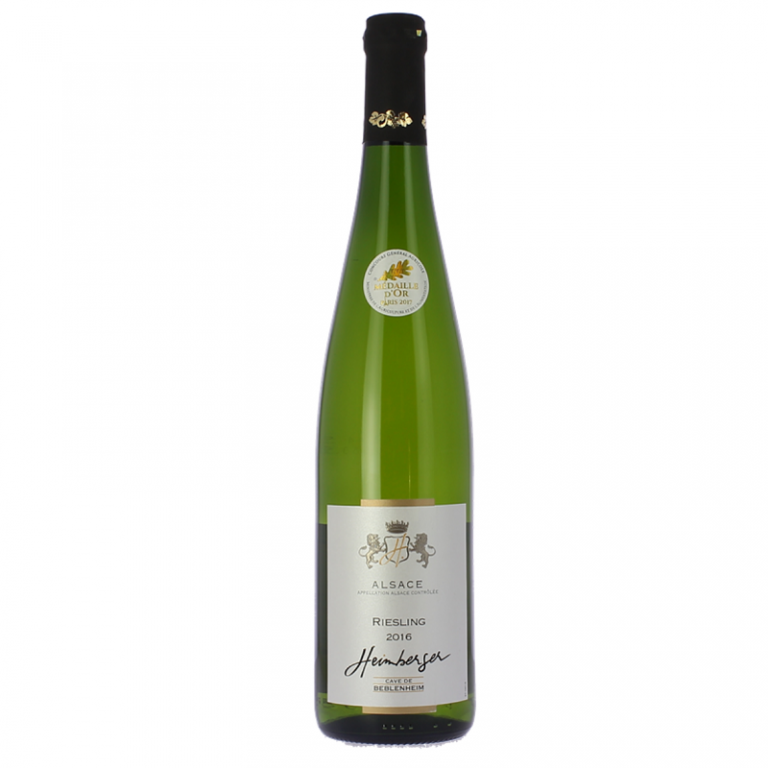 The wines of the Alsace include some of the best white wines in France. 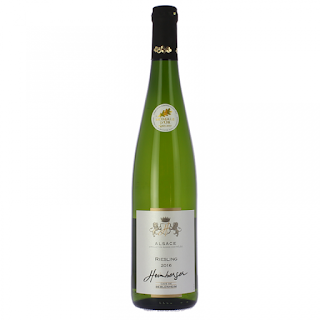 Alsatian wines are also among the very few AOC wines known by the names of the grapes used. Apart from their dry and semi-dry white wines the Alsace also has some of France’s best sweet dessert wines. For choucroute try a semi-dry Gewürztraminer or a Pinot Gris d’Alsace also called or Clevner or Klevner. If it’s a celebration try a brut Crémant de Alsace. Or, try the local beer; nearly 50% of all the beers in France are produced in the Alsace and there are many microbreweries as well. Gewurztraminer grapes in the Alsace. The Alsatians brought the brasseries to other parts of France. Over many generations, Alsatians moved to other parts of France and some of were the owners and chefs of the originally Alsatian brewery based restaurants called brasseries. Today, a brasserie’s menu may have no connection to the Alsace while another, may give away its origins with specific Alsatian dishes on the menu. Anguille, Anguille d'Europe - Freshwater Eels in French Cuisine. Biere - Beer. Ordering a Beer in France? All the French you need to know. Boudins and Black Puddings on French Menus. The Sausages of France II. Cabbage;Cabbage in a French restaurant? Of Course, cabbage is very important on French Menus. Canard – Duck. Duck on French Menus. Carpe - Carp, the Fish on French Menus. Smoked Carp, Fried Carp, Carp Sausages and More. Confit? All About That Confit on Your French Menu. Confit in French Cuisine. Cremants are the best value in French sparkling wines. Dorade, Daurade Royale, or Dorade Royale. Gilthead or Gilthead Sea Bream. Gilthead Seabream on French Menus. Dining in the Alsace, France. - Cuisine à l'Alsacienne. Miel - Honey. The Many, Varied and Wonderful Honeys of France. TheUnique Dishes made with Honey. Mulet and Mulet Dore on French Menus. Grey Mullet and Golden Grey Mullet, the Fish. Munster Cheese.The Premiere Cheese from the Alsace and the Lorraine. The town of Munster in the Alsace. Perche, Perche Commune. 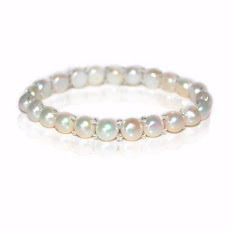 Perch: Fresh Water Perch. Freshwater Perch on French Menus. Silure or Silure Glane - Catfish on French Menus. The Wels Catfish, the European Catfish. 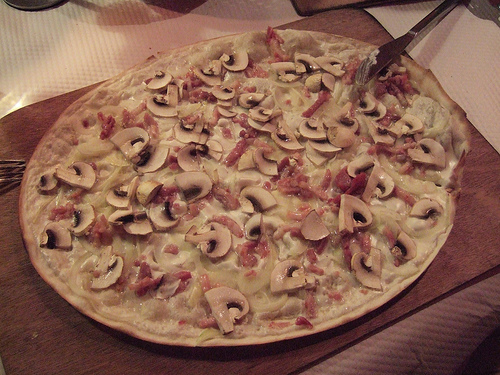 Tarte Flambée,Tarte Flambe, Flammekueche or Flammen Kuechen;Alsace’s Signature Slow Fast Food. Vins d'Alsace - The 11 Wonderful Wines of the Alsace, France.